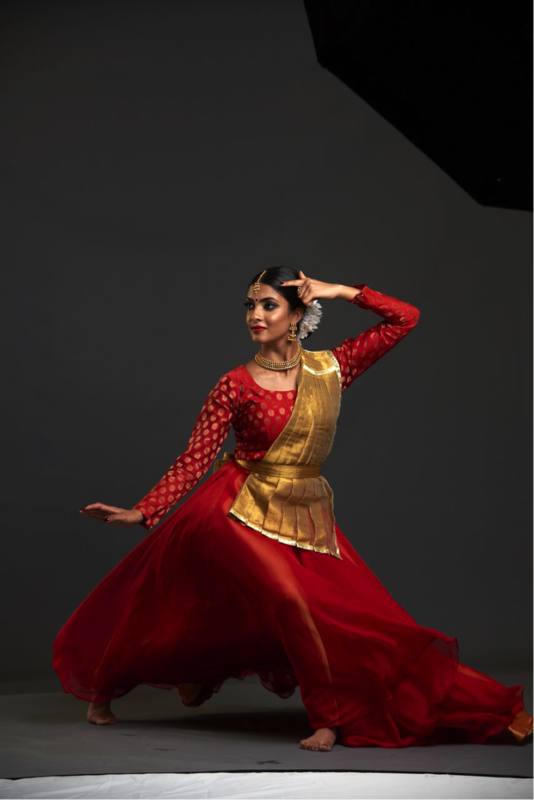 My name is Vidya Patel, I am a Kathak dancer and an alumnus of Centre of Advanced Training at Birmingham DanceXchange. After sixth form I decided to take a gap year to focus on dance and ever since I’ve continued to embark on the journey of a freelance dancer trying to make the most of every opportunity that comes my way. I am based in Birmingham but regularly travel to London to learn with my Kathak guru Sujata Banerjee. In my gap year after successfully entering the South Asian Category of BBC Young Dancer 2015 award and reaching the Grand Finals a lot of doors opened. The competition was an amazing platform from which I gained a lot of exposure that I wouldn’t have otherwise and this led onto other unimaginable opportunities. After BBC I have performed at the Sadler’s Wells Gala held at the Renaissance Hotel, Wembley Stadium for UK Welcomes Modi event, the prestigious BBC Dance Proms and Sadler’s Wells and Birmingham Hippodrome for Sadler’s Sampled. As part of the Kathak company-Sujata Banerjee Dance Company, I toured three cities in India, starting with Delhi where the group piece premiered, ‘Together We Can’ at the Vasant Utsav festival at the Kamani Auditorium Delhi. Recently I had collaborated with Connor Scott for commission to create a duet to open the Navadisha International South Asian Dance Conference held in Birmingham MAC. Through connecting with Shammi Pithia composer and musician during the BBC Young Dance Competition, recently I travelled to Holland with to perform at the Holland India Festival at the Zuiderstrandteatre. In early September 2016 under the guidance of my Kathak Guru Sujata Banerjee I completed my solo graduation performance (Kathak Manch Pravesh) to an invited audience of friends and family to which I performed a full fledged solo consisted of all the Kathak repertoire accompanied by a full orchestra of live Indian classical music. One of the highlights from the competition has been performing at U Dance festival as a guest artist in Plymouth where Richard Alston saw me perform a Kathak classical piece. Later in 2016 he invited me to be a guest artist in the Richard Alston Dance Company to dance in his new creation, ‘An Italian in Madrid’ set to Scarlatti’s sonatas which premiered at Sadler’s Wells in March 2016. Working with Richard has been a fantastic experience and I have really enjoyed dancing alongside the company dancers. I am currently touring with the company in the Autumn/ Spring 2017. My time at CAT has been extremely influential on my dance journey so far. I had applied and successfully auditioned to be part of Centre of Advanced Training (CAT) South Asian strand Kathak at the age of 12 which was also the very first year the programme had started in 2008. I remember being so happy to have got through and really intrigued to see what the programme would be like in actuality. The Birmingham DanceXchange South Asian Strand in partnership with Sampad organization, being the only South Asian strand in the whole of the UK meant that our intensives were different than having weekly sessions like the contemporary strand CAT students. We would meet in the holidays for intensives which lasted for two or three days concluding the year with a five day summer intensive leading up to the annual show case. On my first day I remember seeing so many other dancers my age and making friends wasn’t a problem as we all had one thing already in common. We were introduced to our subject tutors, Sujata Banerjee and Anusha Subramanyam who would be leading our Kathak sessions and devising our Individual Training Plans (ITPs). Our ITP would take place at the end of every term set by the subject tutors- Sujata Banerjee and Lousie O’ Hanlon. This was really beneficial because it gave me a bespoke plan of how to carry on training and practicing in order to improve termly according to my weaknesses and strengths and set an ultimate goal to strive for. This would be assessed and was discussed with the home tutor to help maintain and help the improvement. Goal setting part of ITP’S really helped me to realize that I needed to take more responsibility for my growth and improvement by monitoring my own improvement. Our intensives would begin with both strands Kathak and Bharatnatyam joining for a session of body conditioning where importance of safe practice was emphasized. Before the programme I wasn’t as aware of how the body similarly to an instrument needs to be tuned ready to play whatever it needs to delivers, and it was through the programme this was bought to my awareness. We were so lucky to have highly skilled pilates and yoga teachers instructing us. A lot of the time when we came to find out we had pilates we would all complain knowing the amount of pain we were going to be enduring through the tough workout however after all the blood, sweat and tears we would feel like we’ve accomplishes a huge task. I remember us all having frequent pilate classes taught by Siobhan Collin-McCarthy which were so difficult but so beneficial and energizing. Before graduating from the CAT scheme I was presented with the opportunity to go to Kolkata, India to learn Kathak from Luna Poddar and Sandip Mallick for under a month. This experience confirmed my choice of wanting to take up dance as a profession. it was here where I also learnt her graduating solo to perform at the CAT end of year showcase, and was one of the solos I performed throughout the BBC Young Dancer competition. Spending time in dance intensives we had the privilege of rehearsing and training in the beautiful DanceXchange studios and the help of all the DanceXchange members if ever needed. These relationships created, thanks to the programme are still there and every time I go into DanceXchange now I feel at home as so many memories are linked to the place. Especially during the BBC competition, the support from Birmingham DanceXchange was invaluable, for all the rounds I had rehearsed in the spacious studios which had a huge impact on my final performances at the category round at Riverfront Theatre in Newport, and the Grand Finals at the Sadlers Wells main stage.